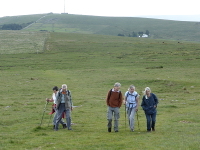 We are a small, friendly group which arranges monthly walks around Devon and Cornwall. Many of our walks are on Dartmoor, with the occasional trip to Bodmin Moor, Exmoor or the South West Coast Path. We typically meet at 10.00 am on the second Saturday of each month. The group is suitable for all ages and all levels of experience, it is not necessary to be an experienced long-distance walker to join. Our website provides information about upcoming events and photo galleries of past walks, as well as guidance for people who may not be familiar with rural walking. Please contact us for more information or to join the group. Meeting at the car park near Dousland at 10.00 am, we will head up the route of the old railway line towards Princetown before turning south and following the Devonport Leat back towards the car park. We headed from the old pump house near Princetown up to Great Mis Tor, before carefully crossing the River Walkham and returning via Merrivale quarry and stone row. If you would like to join the group there is a membership form available here. For other enquiries, please use the contact form below. Fields marked * are required.